Canada Day during this period comes with a free pancake breakfast at Thomson Memorial Park. You don’t need to go to Calgary for this traditional treat. Other Canada Day events include fireworks in at least seven different locations. Most are without charge except for the food and have multicultural performers. For an emphasis on Chinese flavour, there’s a special celebration in East Chinatown. In early July look also for the lively Afrofest, a window on the Barbados and things Caribbean, and a Hindu festival where women pray for the prosperity and longevity of their husbands. A Latino festival will be on St. Clair. The International Jazz Festival will be at the Beaches and elsewhere for several days this month. 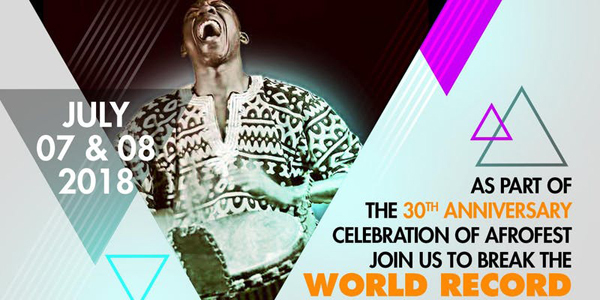 “…we will attempt to break the Guinness World Record for the highest number of djembe drummers playing simultaneously. “We will improve the international profile of the festival by promoting it in international markets specifically: United States of America, Europe and Africa. Barbados. Barbados on the Water. July 7-8. Free. Harbourfront Centre; concerts, food vendors, children’s activities and more… Largest cultural celebration of Barbadian culture in Canada. 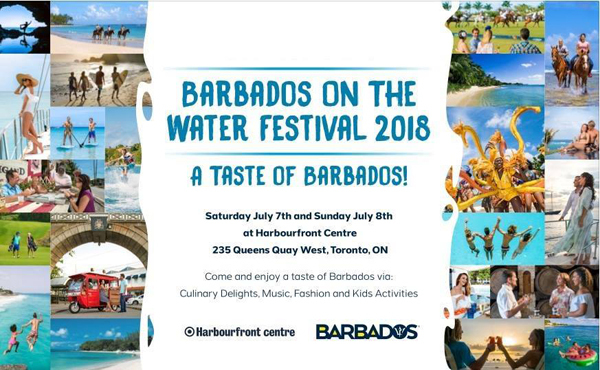 From a taste of the famous “Oistin’s Fish Fry” to the soca beats of Spice & Co. and rum tastings.” For details and schedule: http://www.harbourfrontcentre.com/whatson/today.cfm?discipline_id=&mode=day&&month=07&year=2018&day=7&week=27&searchvenue= Canada. Canada Day. July 1. Canada as a nation was born in 1867. Celebrations all over the city and country. Most stores and offices closed. This commemorates the signing of the British North America Act (today called the Constitution Act, 1867), which united three British colonies into a single country. Originally called Dominion Day, the name was changed in 1982, the year that Canada gained full independence from the United Kingdom. Especially with regard to our indigenous nations who have been here for at least 12,000 years, we have not always been an exemplary multicultural nation. The original treaties with the aboriginal peoples have not always been honoured or respected. 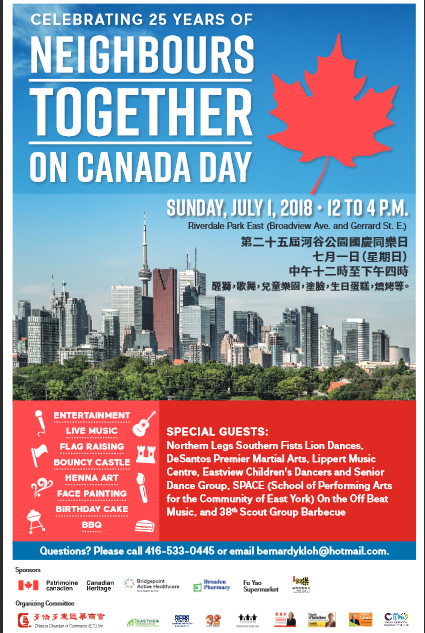 Free Canada Day July 1 celebrations are in many parts of the city. East Chinatown. Northwest corner Broadview and Gerrard. For questions, please telephone 416-533-0445. Or email bernardykloh@hotmail.com. Lambton House, 4066 Old Dundas Street West. Annual Canada Day BBQ. 11am – 2pm. 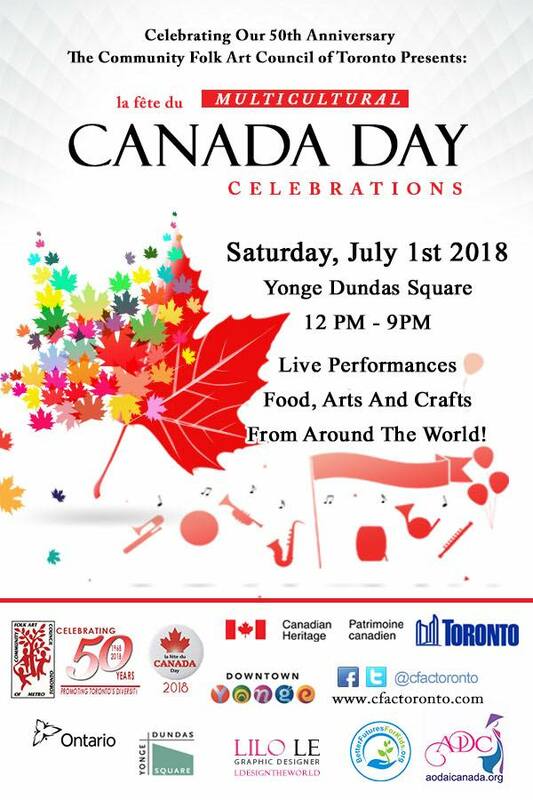 “You are invited to join Heritage York on Sunday, July 1st, to celebrate Canada Day at a burgers and hotdogs barbecue on the grounds of historic Lambton House by the Humber River on Old Dundas Street. The former tavern, on the east River bank is the last structure from the 19th century milling/industrial era. Mel Lastman Square, 5100 Yonge Street. Beginning at 5pm. Live performances by Blues/R&B diva Shakura S’Aida, socially conscious Pan-Latinx hip hop by Los Poetas, dance hall party vibes by DJ Nino Brown (Yes Yes Y’all), and more. Hula hoops, face painting, and a participatory mural by street artist Rahmaan Hameed. Fireworks at 10:30pm. For more information visit toronto.ca/canadaday. Toronto History Museums. Musketry and artillery demonstrations at Fort York, historic treats and a vendor market at Scarborough Museum. Create your own maple leaf postcard on the 1845 press at Mackenzie House. Click here for hours and admission details. India. Hindu. Vat Purinama. Wednesday June 27. Time of Haldi Kumkum: 5pm-7pm. Shri Vitthal Hindu Mandir, 5359 Timberlea Blvd., Unit 10 Mississauga. More information: Smt. MeghanaThakur: 905-450-1740. All are welcome! “Vat Purinama is a celebration that coincides with the full moon that is set to occur on Wednesday June 27. 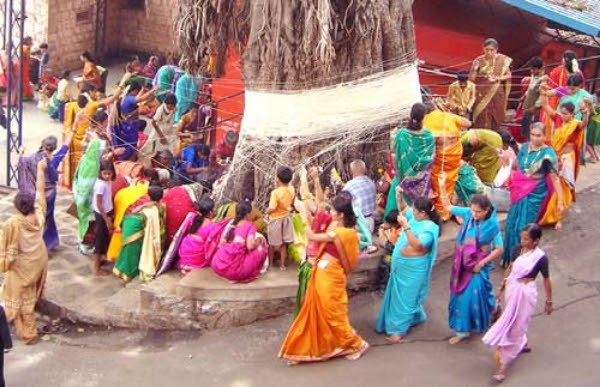 Traditionally women pray for the prosperity and longevity of their husbands by tying threads around a banyan tree. It honors Savitri, the legendary wife who rescued her husband’s soul from the ruler of the departed, Yama.” http://www.shrivitthal.com; info@shrivitthal.com. Image of women and banyan tree from website www.shrivitthal.com. For uptodate information on affordable events in our culturally-diverse city, please subscribe to our newsletter above.